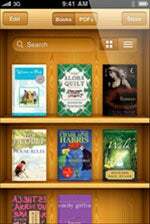 Buying e-books sounds so easy, and using them seems so effortless. The books are a breeze to purchase, and you can easily store great numbers of them, especially if your e-reader has a removable storage card. Not surprisingly, e-book sales are jumping. In fact, a report by Forrester Research predicts that sales of digital titles (and readers) will top $1 billion in 2011. And the New York Times this week started adding e-books to its weekly Best Sellers list. As your collection grows, though, so does your need to manage the resulting virtual library. IF you aren't careful, you'll find yourself with books purchased on Amazon.com that are readable only on an Amazon Kindle e-reader device or app, books purchased at Barnes & Noble that require a Nook e-reader device or app, books purchased through Apple that are viewable only on the Apple iBooks app, and so on. The issue of incompatible formats and the difficulty of organizing books that you buy from different e-book sellers are two things that you should consider before committing to a specific e-book platform. In the days of physical bookshelves filled with physical books, most people tended to organize their libraries haphazardly--perhaps by subject, perhaps alphabetically, perhaps by what size of books a particular shelf could accommodate. But with a little effort you could (probably) quickly scan your collection and walk away with the title you wished to read in short order. Unfortunately, the lack of a universal bookshelf is a huge issue in the e-book world. Buy a book, and if you want to read it again three years down the line, you'll have to remember where and how you bought it. A Google search reveals various software programs designed to "convert" e-books. But generally, such programs entail converting what you have into a PDFfile--and most types of e-reader software and hardware do a crummy job with handling PDFs. 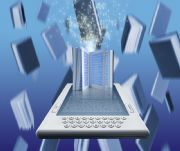 Ultimately, what consumers need is e-books that they can buy and read anywhere, using any software they choose on any device they have at hand, whether it be a phone, a tablet, a laptop, or a PC. No muss, no fuss. This issue is critical to library management and to the future success of e-books. The concept of buy-anywhere content will drive the digital publishing industry, according to a new study from ABI Research. The flexibility of the multiplatform world established by Amazon, Barnes & Noble, and Kobo has its good points, but consumers need more. In the study--"Digital Publishing for Portable Devices"--ABI notes that digital sales of books, newspapers, and magazines are expected to grow to nearly $16.5 billion worldwide in 2016. That figure is more than five times greater the corresponding number for 2010, and it approaches half the total for the publishing industry as a whole. We wouldn't be surprised if the rise in digital sales were even more rapid if the current barriers among types of software and devices broke down entirely. The digital rights management issue remains a point of distinction between Amazon and its competitors. Sony and Kobo, which sell e-book readers as well as e-books, are quick to point out that they, unlike Amazon, use the industry standard ePub format; Apple does, too. But ePub support alone isn't synonymous with cross-platform support. Applying DRM to an ePub file can make the ePub book incompatible with other e-readers (be they software or hardware). For example, Adobe Digital Editions ePubs that carry DRM can be read by other software or devices (like Sony's Digital Reader series of e-readers) that support Adobe Digital Editions. But if you use Adobe's PC-based library manager, you'll have to jump through the hoop of entering an Adobe ID. Barnes & Noble's e-book shopping experience can be even more confusing: The company has voiced support for ePub, and it offers ePub-formatted books; but when you buy a book, you have no way of knowing whether it has DRM protected. If it is, it's locked to Barnes & Noble's system. Furthermore, if you want to redownload an e-book you bought from Barnes & Noble, you'll have to provide the credit card number that you used to buy it originally. Apple applies its own DRM on top of ePub, so don't bother trying to port titles that you buy at iBooks over to anything other than an Apple iOS-based device (such as an iPad or an iPhone). And Google Books, the latest comer in the e-bookseller arena, brings its own DRM to bear. It's easy to assume that if you buy a Kindle, you'll shop at Amazon.Nevertheless, the concept of "buy once, read anywhere" is flourishing. Though Amazon, B&N, and Kobo sell their own hardware, they make Android, BlackBerry, iOS, and PC apps available as well. Effectively this means that you can read books, magazines, or newspapers that you purchase at one of these stores on most devices you're likely to have in the future--if you use the appropriate platform's app. The appeal of buy-anywhere is twofold. First, consumers need the freedom to shop freely at different e-bookstores, just as they can shop for Blu-ray movie discs at any of a number of retailers, online or otherwise.Second, consumers need to be able to view the contents of their purchased libraries in a unified fashion. The more books we collect, the greater will be our need to be able to organize our collection. The on-board e-reader organizational tools are fine for a handful of books, but for dozens or hundreds of books accumulated over the years, they're inadequate.